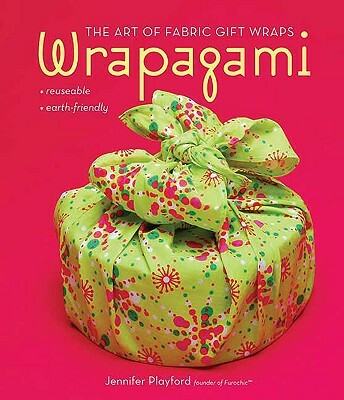 Discover how to use a simple square of fabric to beautifully wrap gifts of any shape or size--with Wrapagami. In this gorgeously photographed book, award-winning designer Jennifer Playford, inspired by the traditional Japanese fabric wraps known as furoshiki, shows exactly how to use fabric to create modern, eco-friendly (they're reusable) gift wraps. It's so easy--all you need is a square piece of fabric-- and with a few simple twists and ties, you can creatively wrap a wide variety of shapes from simple rectangles (such as books) to more challenging shapes (bottles) to things you might previously have thought un-wrappable (melons). Clear written instructions, easy-to-follow diagrams, and beautiful photos of the finished wraps make it easy to wrap expertly the first time. Jennifer shows the basic techniques for every shape, and presents twenty-five stunning wraps, complete with decorative embellishments for every occasion, from weddings to birthdays. Also included are innovative ideas galore for using wrapagami every day (carry your lunch, and then use the wrap as a picnic blanket) and reusing the wraps (to wrap again, or repurpose in a multitude of ways). JENNIFER PLAYFORD is an illustrator and graphic designer whose vibrant and whimsical illustrations adorn her own line of stationery and fabric gift wrap. Jenn is the creator of the award-winning Furochic(TM) wraps. She lives in Victoria, British Columbia.